Appearance || Shun is a big wolf, he has a bit longer legs than most wolves have, but these long legs make him far from clumsy; they make him faster. Shun looks rather dangerous with this big body and long height due his slightly longer legs, but he's far from dangerous. He looks pretty handsome and is well-muscled underneath his coat. Shun has a short coat which is rough to the touch, if you would pet him along his back, sides and belly. The fur around his neck is a bit thicker than on the rest of his body, so this fur feels slightly more fluffy, while Shun’s forehead and muzzle feel rather soft due the soft and fine small hairs on his face. His coat is a very easy color to see; he has a black coat with no streaks of lighter grey or white through it at all. his coat however is a bit lighter color than his nose, which is as black as night. Eye Color || Shun has amber eyes, but due having heterochromea, his right eye is a bit lighter colored than his left one, making it appear more like a honey golden color than an amber color. Markings || Shun has pretty obvious markings you could say; he has a grey chest and a very small grey tail tip. Scars || Shun has a lot of scars under his thick coat which aren’t visible, due his history as a warrior. Personality || Shun looks dangerous due his size and strong body build, but he's not dangerous or aggressive at all; he's far from that. Shun is a sweet and caring wolf who loves to help others. He is pretty emotional and can get pretty much sad by others calling him names or being rude to him. This makes him great at commiserating with others, as he’s able to know exactly how they feel, whatever the situation it. He's also amazingly loyal and isn't afraid or lazy to follow orders and please others. He listens greatly to wolves higher in rank and is really wise and a good mentor to younger wolves or wolves lower in rank. He's also very smart and knows when someone's lying, but he also knows the right time when to correct others and who, or when to just leave those wolves believing their own lies, as to not cause any unwanted attention towards him. But even though Shun acts like a sweet and caring wolf on the outside, Shun is really shy and doesn’t really like crowded places, feeling closed in most of the time. He’s also pretty much a loner and prefers to be on his own, but he doesn’t step back when someone wants to have a conversation with him. He’s still sad about the loss of his mate Haya, but tries not to show his sorrow, even though the pain of his loss and the shame of not looking after her well enough eats him from the inside, making him quite depressed. He never shows it, but he feels terrible everyday. He feels responsible for losing her and his pups. A bad habit of Shun is that he might be a bit clingy; when he knows someone in a pack he’s staying at for a while, he will mostly talk to that wolf, and barely to any other wolf, unless he gets to know others better and starts clinging on them more. He clings because he's worried about their health and safely and because he feels responsible for keeping them safe, even though those wolves can take care of themselves. He also clings because he's a loner, but he leans towards those he knows well, as he actually doesn't want to be alone, but he doesn't really know how to tell others about his feelings. But overall a very sweet and caring male, not flirty and not aggressive at all who prefers to be good to others and never thinks about his own needs. Strengths || Shun is very strong due his big body and well-muscled build, making him great at fighting. He’s also really fast due his slightly longer legs, though only during fast sprints and quickly jumping away, like a cheetah can do. Weaknesses || Shun isn’t very good at hiding in places due his big body size and his rather long legs, so another wolf can easily find him when he tries to hide. Shun also doesn’t have such great stamina; he gets tired easily. Likes || Shun likes to be on his own pretty much as he’s quite the loner, but he doesn’t back down for a fun conversation with someone. He likes to relax and take it easy in his life, swimming and sunbathing, sleeping most of the day or hunting just for the fun and the good feeling it gives. Dislikes || He doesn’t like crowded places and gets easily nervous around many wolves who are with him at the same time in the same place. He will either back off shyly or wait at the edge of the crowd till everything calms down again. Shun also hates stressful situations in which he has to make a choice quickly, and even though he’s build for fighting, he hates to fight and argue with others, as he really hates to spill blood. He doesn’t want to hurt anyone. Dreams || None anymore, after finding his dead mate and pups his dreams were crushed. Fears || This male is afraid to not make friends and be on his own for the rest of his life. He’s pretty much a loner mostly, but being completely alone is something he doesn’t want to happen. He’s also afraid to fall in love again, as he's certain his died mate would hate him for it. Shun was born on a stormy night in a litter of three pups. He was the second one born, his sister Shanya the firstborn. The third pup however was stillborn, which meant only two pups were left after birth. Luckily Shun and Shanya were strong, so their parents didn’t have to worry much about whether they would make the first night or not, because they both would. They named their children Takeru and Shanya. Shun and Shanya both had a great pup hood their first few months of life; Shanya became headstrong and brave, making many friends among their birth pack. Shun however stayed a bit more quiet, often being on his own. He didn’t make any real friends in his pack, but he didn’t care, because everyone respected him. As long as he got respect from others he didn’t mind. When he was nine months old his parents went on a hunt with him and his sister, teaching them how to bring down any kind of prey. They started with hunting down small prey like hares and birds and mice, and soon went on to elk and moose the next days, as soon as they got the hang of it. However, one day when they decided to try and bring down an elk. Their parents had learned them to hunt down weak prey like sick or wounded cow elks, but Shanya was sure she could take on a bull and so she went, ignoring her parents’ orders. Soon their parents decided to join in after all, because the bull elk seemed weakened, and Shun had no other choice than to join them in the chase himself, too. As the chase went on the bull elk tired, but as any wild animal willing to keep on living it didn’t back down as quick as the wolves wanted to. Instead it turned around and fought back, its antlers directed at the four wolves. All ducking out of the way, they thought they were safe. Though, three wolves were safe; Esan, Shun’s father, had been hit by the bull’s antlers. He lay on the ground, dead, with puddles of blood surrounding his corpse. The alpha had died and Shun and Shanya couldn’t even grief about his death, because after returning from the failed hunt their mother stepped down as alpha female, her mind in a depressive state after seeing her mate losing his life. A new alpha had to be assigned and everyone wanted Shun to become it, as the male was the alpha’s only son and a pretty big and strong wolf. Being still at such a young age and with no experience with leading a pack, Shun refused. Shanya stepped forward to take on the rank as alpha, but her dream got crushed by the older wolves not wanting her to be the new leader. So a male stepped up. It was a stranger to Shun, he had never seen or met him before, but he was big and strong and had a soft and warm expression, wise and caring, seeming to be fit for the job. 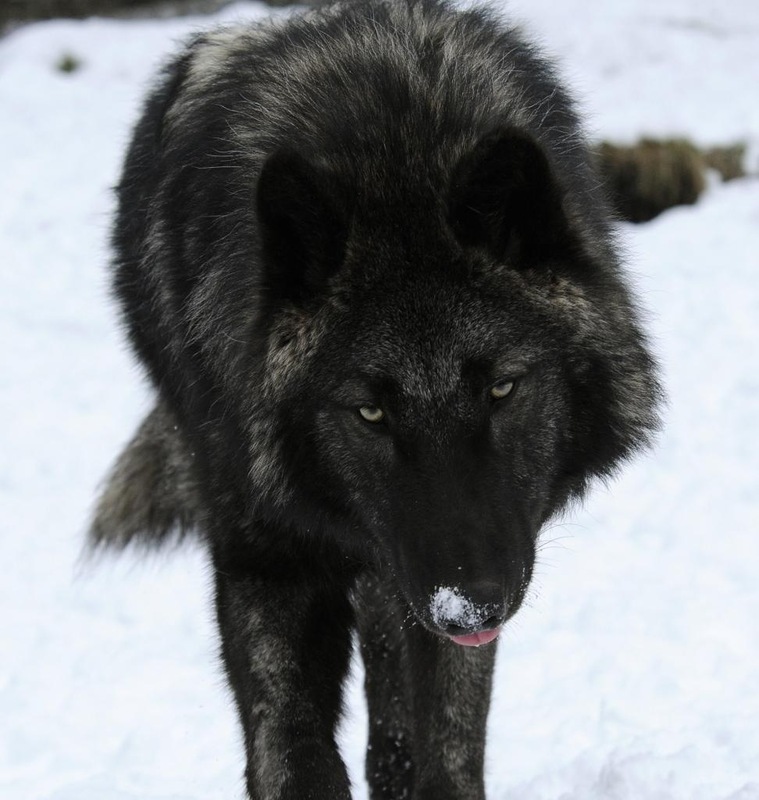 After moments of hesitating the wolves accepted this male, called Yamato, as their new alpha. He asked Shun’s mother to step back up and lead together with him, but his mother declined the request. The pack did well with Yamato as their leader and Shun was assigned as warrior, with his sister Shanya as lead warrior. At least, that was what they were going to be trained for, but Shun didn’t want to be a warrior. He didn’t know what he wanted to be, but he didn’t want to fight, he didn’t want to hurt or kill anyone. But he couldn’t refuse; refusing meant you disobeyed your alpha’s orders and the pack’s rules, so he kept his mouth shut and trained to become a warrior. When he became eleven months old his training was halfway done and he really hated it, but he couldn’t request for another rank. His sister Shanya did well as lead warrior in training and often bossed him around, giving him orders. Shun often disobeyed them because he really began to hate his sister, but he soon couldn’t ignore her anymore as her trainer started to bug him about his behavior towards his higher ranked sister. At the same time his mother became a bit more happy, often walking around the area to see the new wolves that had joined over the few months, and to meet them and welcome them. As a former alpha she didn’t have a rank anymore, but was pretty much still accepted and a lot of wolves asked her for advice and listened to her. And her strong and more and more happy becoming personality seemed to be pretty much in favor with Yamato. Shun didn’t know much about the relationship between the two and was shocked when he heard his mother and Yamato had become mates after another month of friendship. And as soon as she told the pack she was expecting pups Shun’s heart dropped; he didn’t want any more siblings, and especially not with Yamato being their father, because Shun had become to hate their new leader, always thinking he was right. When he was around one year old his new siblings were born, four pups to be exact. Two didn’t survive the night, but the first and last born stayed alive. Shun found this rather odd, because the last born was really small and weak, and so not able to survive. Hoping the pup would die in the second night, Shun sat in front of the den to keep watch over his mother and newborn siblings. However, the next day the fragile and weak pup was still alive, much stronger than he was the first night. And he become stronger the many days of his life that followed after. The two new pups were named Mustafa and Jeamesero and Shun actually began to like the little runt as he met him on his first day outside in the open world. The little pups reminded Shun of himself and Shanya; Mustafa was just as brave and headstrong as Shanya, while Jeamesero was just like his build; small and weak, and very cute. He was a sweet little kid, and soon enough Shun’s best and only friend as they spent a lot of time together. Jeamesero saw Shun as his teacher, his mentor and big brother, often calling him Ni Ni, and Shun loved the little kid to pieces. Another year passed by, rather peacefully, though Shun still pretty much hated to do his job as a warrior. He had killed and wounded a lot of wolves during the last year, and a lot of wolves had wounded him. Feeling pretty much fed up with spilling blood Shun went off to Yamato to tell he was not suited for his job. Yamato wasn’t pleased with Shun’s confession and told him to make a choice: whether he would stay in the pack and keep his job as a warrior or leave and never return, starting and deciding his own life. Shun never wanted to see blood again and chose the last option Yamato gave him. He told Jeamesero, now a yearling, and his mother goodbye and left the pack the next morning, on his own. Shun had always been on his own, most of his life, so he didn’t care about leaving and being all alone. And being at the age of two he had enough experience in hunting too keep himself alive. After a month of traveling on his own Shun went to a river to drink, where he met a sweet female from around the same age, called Haya. She was wounded and Shun decided to stay around for a while and help her. Haya asked for his name and he told her his name was Shun, leaving out his real name, which was Takeru. This was the first time Shun went with the name he has been holding until now, feeling like he should start over with his life, having a fresh start. The two stayed together for another month and even after her paw had healed, Haya kept on traveling with him. The two soon grew closer together and after a few months knowing each other they became mates. And not soon after that Haya told him she was pregnant. Shun had never thought he would find love, and he knew he had never been happier in his life than together with his beloved mate and with their offspring on the way. He promised Haya they would find a good home to live together, and to raise their pups safely. However, their happiness didn’t last long; they traveled days in search for a new place and as winter become stronger, snowstorms occurred. The two wolves had to find a safe and warm place quick or else they pups would die. Keeping on traveling Shun and Haya lost sight of each other due a terrible storm eventually, and Shun went looking for her. But sadly he couldn’t find her back anymore and he was forced to safe his own life first. The next day the storm had passed and Shun went in search for his mate, but it was only a waste of time; he has been searching for her ever since, and has never found her back. He doesn’t know whether she or his pups are alive, but he can only hope to ever see them again. On his way he met the pup Aura, who was all alone, abandoned by both her parents and stepparents. Shun felt bad for the little kid and took her in, adopting her as his little sister. After that Shun hadn't been completely alone in his search for his lost mate, as Aura always was there with him. However, soon Shun lost sight of Aura. She had either lost her way or died, and Shun felt responsible. He had lost another one, just like his mate and pups, and it hit him hard. 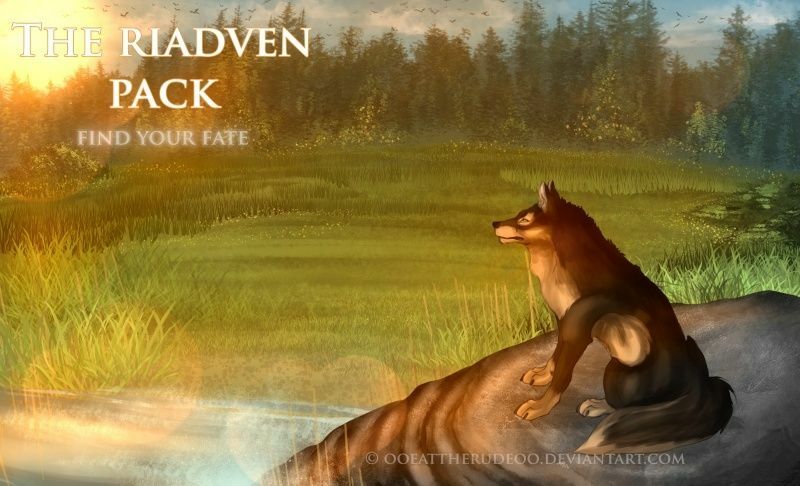 However, he knew he had to keep on going and soon after losing Aura he stumbled upon a pack, called Riadven. They were kind and took him in right away, feeding him and giving him shelter because he was weak and hungry. Shun was ready to leave the pack again and search for his lost mate and pups when suddenly a familiar face met his eyes; his half brother Jeamesero. It seemed Jeamesero had joined the pack long ago and Shun decided to stay, feeling responsible for Jeamesero's safety. However, soon after Jeamesero left with another wolf to show them around the territory, Shun began to think whether or not it was good to baby Jeamesero all the time. And not long after Shun had made a decision; he was going to leave the pack to search for his lost mate and pups. He told Verine goodbye, who was the one that had helped him from the start, and left the pack in search for his family. After months, what felt like forever, of searching, he found his mate and his possible pups, all yearlings now. Though, the sight was terrible. They were dead, killed by a bear most likely. Body cold and stiff, and eyes hollow and expressionless. It had happened around a week ago, Shun guessed. He had been too late. His family was now dead, and Shun was all alone. He grew even more quiet and depressed, he knew for sure he would never love someone else again. Shun didn't know where to go now, now that he had lost the ones he cared about most. He wandered around all alone for a few more months, refusing to go with several wolves he had met on his way. Because he was afraid they would die as well, he was afraid he would do something stupid and get them killed. But after a whole he remembered he still had family, and he knew where this wolf was; Jeamesero, at Riadven. The wolves had been so kind, they had accepted him right away, and Jeamesero was there. He could be a big brother again, he could care for Jeamesero. That was the only thing on his mind right now. Jeamesero, and Jeamesero only. So with that thought Shun set off on another journey, back to Riadven's territory. Back to Jeamesero, to join the pack once more and be with his sibling. Scent || Shun smells like mud/sand that has become wet by rain, so a bit like a fresh scent of a just passed storm in the woods. Voice || Shun’s voice is the same as Adam Gontier, Three Days Grace’s lead-singer. But Shun’s voice sounds a bit softer than his, a bit more friendly.